Rumors abound concerning large markups contractors can place on materials they provide for projects, but are they true? Are you better off buying your wood and fiber cement siding from a home improvement store, or can you actually get a competitive price from the contractor hired for the installation? The answer can depend on the material and the contractor, but in most situations you might find that the rumor doesn't have much factual support. 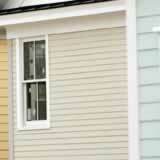 How do contractors figure material markup into your siding cost? Contractors can often get a discount on materials if they use a certain volume from a particular manufacturer each year, deal with one or two reliable distributors, and pay their suppliers' invoices on time. This allows them to purchase the wood or fiber cement siding for your home much cheaper than a homeowner who walks in off the street. Many contractors do not put any markup on the siding cost -- it's simply added to the labor they figure is necessary to side your home. Then they add a percentage to that total in order to cover their overhead and make a small profit. Overhead can vary depending on whether they pay for office space and whether they use their own crews or sub the job out to independent installers. A bigger contractor may often have more overhead, but that might be offset by a larger volume of work. According to the R.S. Means Repair & Remodeling Cost Data guidebook, nationally most siding contractors add an average of 38 percent for overhead and profit to their material and labor costs. This may vary in your area, but when all is said and done, the siding cost of purchasing materials through a contractor is normally about the same as buying directly from a retailer. The benefit is that when buy through your contractor, you usually encounter fewer headaches.